Welcome to the Adam Binder Club Website! We are an Independent, Virtual Club of collectors of Adam Binder's artwork. Our mission is to promote interest in the artwork of Adam Binder and to share information about the artist and his work with his collectors. Join our Club and receive email Alerts with breaking news about Adam and his work! Participate in our members-only contests and drawings! Purchase exclusive Club pieces! Click on the "Join ABC" link to find out how to join today! Adam Binder editions now has two websites! The winner of the Bling Tortoise Drawing was # 62, Vince Scheidt. Boris: Adam's life size polar bear! Adam named Artist of the Year 2011 in the Sculpture Category! 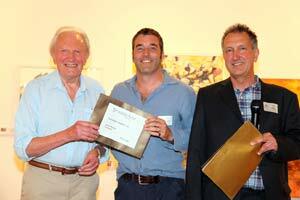 Adam receiving the award from David Shepherd in the Mall Galleries, London. Adam has won the Sculpture category of the David Shepherd Foundation two years in a row! "The competition attracted a fantastic range of work from artists from all over the world but Adam's work was so beautifully tactile that we couldn’t resist," said David Shepherd. 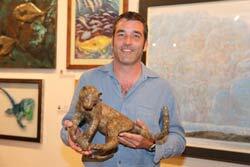 Adam holding his winning Leopard bronze sculpture. Adam named Wildlife Artist of the Year 2010! FIRE & ICE EVENT UPDATE! The Fire & Ice Event is now over but you can see photos of the event by clicking here! Winners of the prizes of the Charity Raffle are posted here ! An Exclusive Adam Binder Piece for the ABC and Adam Binder Editions Collectors Board! An Exclusive Adam Binder Piece for the ABC! The FIRST piece in a new series! Another Exclusive Adam Binder Piece for the ABC!